Arizonans have been demanding that the Legislature focus on education, not incarceration. But Republicans continue to dole out multi-million dollar private-prison contracts as our district schools struggle and the state’s per-pupil spending remains among the lowest in the country. And the governor’s current budget proposal provides more general fund money for the Department of Corrections (DOC) than for the Department of Economic Security, Department of Health Services or state universities. With that level of investment, there needs to be more accountability and transparency. There is no question that prison reform should be a bipartisan issue. Other states are attempting to improve public safety and bring down the cost of incarceration by looking at sentencing, reducing recidivism and instituting drug treatment programs. Public safety in Arizona could benefit from similar reforms. We should invest in programs that reduce recidivism, instead of investing in private prison growth. To achieve this, Legislative Democrats have introduced a series of bills focused on public safety. These bills would direct the Arizona Criminal Justice Commission to study the current system and make recommendations and would reinstate the Joint Select Committee on Corrections to provide oversight of the DOC and private prisons. These efforts would cost the state nothing. Democrats also proposed legislation to invest $7 million in drug treatment and Drug Treatment Alternative Programs (DTAP) and a Maricopa Community Corrections Center. Every year, thousands of former inmates are sent back to prison for minor technical violations of their probation conditions. The Maricopa Community Corrections Center, modeled on Pima County’s successful community corrections center, would provide an alternative to returning these former inmates to prison and save the state significant sums of money. 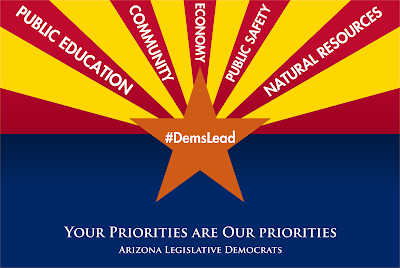 To see a summary of the Democrats’ full, five-step plan for moving Arizona forward, including improvements to public safety and links to the legislation, click here.